"Sorry for the delay," I said to Gloria as I finally came out of my study. "I had to teach that scoundrel Rene Dupont a lesson. And I did, but in his defeat, he hinted at a wider conspiracy." Man, this game is good. So, so good. I like the match-three mechanic. I find it very relaxing to play games that use it. My problem, though, is that the games are invariably either 1) incredibly repetitive or 2) largely lacking in strategy. Well, welcome to a game that addresses all that. 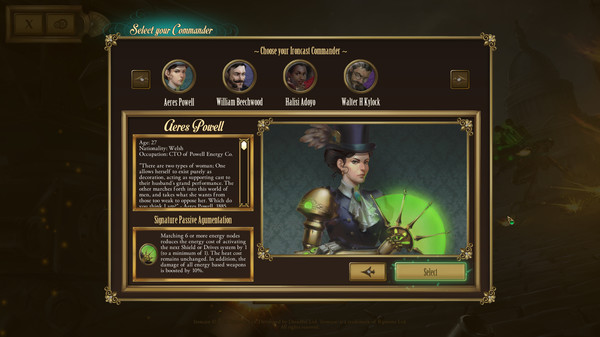 Take control of a 7 metre walking vehicle from an alternate Victorian era in this turn-based strategy game. That's a "Hell, yes!" description if I ever heard one. And amazingly, the game delivers on every one of those elements. Here's how the game works. There are three basic areas in the game: the hangar (where your mech is stored and gets repaired/upgraded between missions), the strategic map (where you choose which mission to take on next), and the battle environment (where you battle other Ironcasts/steamtanks). The strategic options are many and quite interesting. In the hangar, after almost every mission, you can choose augmentations/abilities for your Ironcast. You also may have the opportunity to build a new bit of equipment (weapons/drives/shields) to replace an existing one. There are enough options here that it take s a bit of time to consider everything you might do. Do I need an improved weapon more than a better drive system or better shields? What's the energy consumption profile of that new weapon? Is the increased damage worth the increased energy it uses? 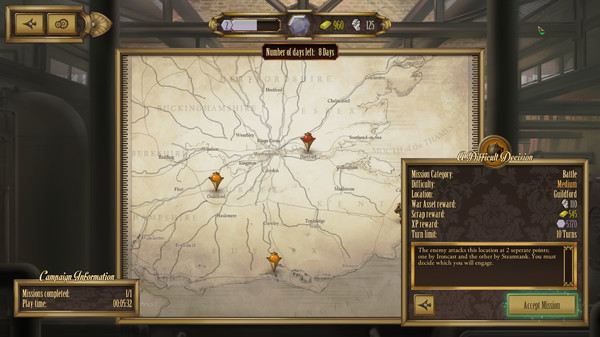 On the strategic map, you will choose between multiple available missions, some with different difficulty levels. There's a nice bit of variety in these missions, too. Sometimes, you'll be collecting supplies in battle, or fighting multiple enemies in sequence, or trying to win a battle without targeting certain extremely valuable parts of the enemy (so that you can then build that part and use it for yourself). You only have a certain number of days before you meet a boss, so you scramble to upgrade your machine as quickly as possible. In battle, the complexities are excellent. You have several resources in battle: weapons, defense, energy, and repair. Matching what you need is an interesting exercise (sometimes maddening, too, depending on the shape of the board at the time). In any single turn, you can have three matching sequences. However, those sequences just add resources to the area you matched. Using those resources in an action is entirely separate, and limited only by how many resources you have. Matching resource tiles add to the various resource bars at the top of the screen. You can play an action (shoot/shields/walk) at any point during your turn, as long as you have the resources. Using a weapon or a shield/drive mechanism consumes energy, so you often have to decide what is more important: offense or defense. On offense, you have two weapons, with different damage patterns and different effectiveness, depending on the opponent's shields and walking speed at the time. Defense is also broken down into shields and drive, so you can either raise the shields or have your Ironcast walk at a higher speed (which reduces the accuracy of your opponent's attack with certain weapons). You can almost never do everything you want, which is good game design. In any single battle, you will make many, many choices, and it's very satisfying. For instance, subsystems can be targeted, attacking can be more complex than just dealing out general damage. 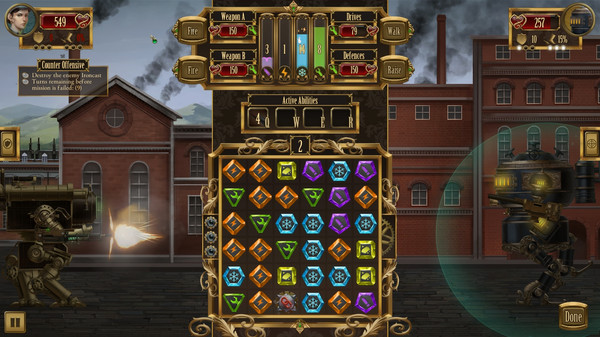 During a battle, you're also trying to match scrap tiles, which provide the raw resources necessary to build upgrades. Even better, the game handles all this complexity in a very straightforward, intuitive fashion. 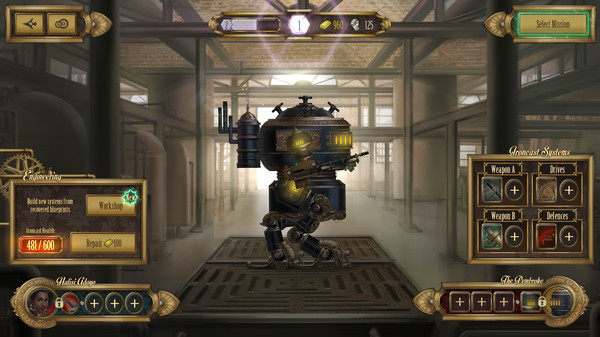 This is an extraordinarily well-designed game in terms of being friendly to the user. Also, it's not easy. You're always on Ironman mode, so if you lose a battle, it's game over. However, your experience during that playthrough contributes to a global unlock category, which gives you small stats bonus/abilities that will permanently improve your starting character.